Costs: Abilities 52+ Skills 16+ Advantages 4+ Powers 54+ Defenses 24= 150 pts. Identity: Mr. Modify keeps his identity of John Novak a secret to protect his mother from the foes he might gain. 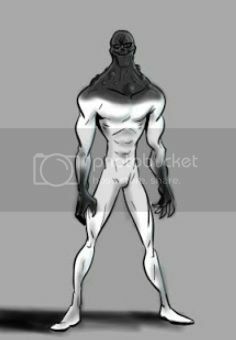 New Guy: Mr. Modify is a newer hero on the scene and isn't well known, this normally means that super villains have no idea who he is and often disrespect him. Reputation ~Friend of the Tomorrow People: As the Tomorrow have a reputation as criminals, Mr. Modify's being trained by them and friends with many of the members some members of the heroic community question exactly his intentions are. 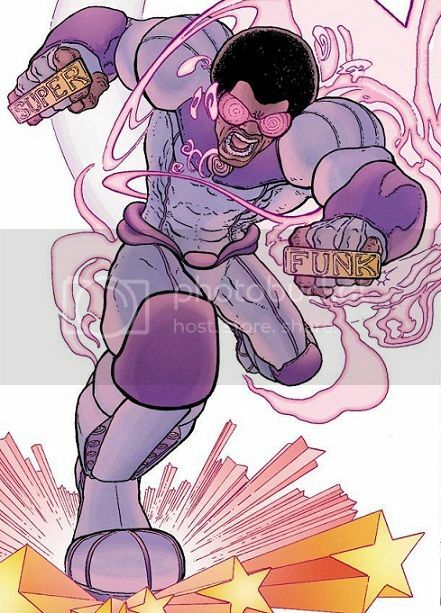 Background: John Novak was a teenager when his mutant powers first manifested; able to alter the chemical composition of anything he touches into its elemental components or turn them into other forms (though he need to fully understand the physical composition of the desired result). With little control over his powers, John was turning objects he touched into gold. This drew the attention of a group of trolls who, centuries ago, had been driven underground by humanity. The trolls wanted to reclaim the British Isles for their kind and thus kidnapped John in order to have him create an abundance of gold that would collapse the British economy, but John refused to comply with their demand. Meanwhile John's mother had witnessed her son's abduction by the trolls and contacted the police, though her story made them think she was out of touch mentally and they instead had her committed to an asylum for observation. But before she was committed John's mother managed to contact members of the media about what had happened to John. The resulting story got the attention of the Tomorrow People, who travelled to the U.K. locate John. They managed to locate the trolls, following a trail of gold that John had left behind when he was kidnapped, but the trolls defeated and imprisoned the Tomorrow People. The trolls then tried to force Thomas to obey by threatening to hurt his mother, whom they had taken from the asylum. In order to protect his mother John turned the troll leaders, Phy and Phee, into gold, an action that caused the remaining trolls to retreated into a portal to the . After Madame Tomorrow settled things with local authorities, John used his powers to turn the golden trolls into lead as to avoid the aforementioned economic problems and placed the leaden trolls in Hyde Park as statues. John decided to take Madame Tomorrow up on her offer to come with the Tomorrow People to Castle Mass so he could be trained in the use of is powers, specifically studying biochemistry so that he could restore the leaden trolls back to normal eventually. A few years later the trolls returned, kidnapping Alchemy's mother and forced him to do their bidding, though he secretly let the Tomorrow People know what was happening. On their way to restore the leaden trolls back to normal, the trolls and John ran into the Crown Guard and the two groups fought. During the melee John was forced to turn Big Ben and Zero into gold, which allowed the trolls to get away with John and his mother. When the Tomorrow People arrived and explained what was going on to the Crown Guard and together the two groups managed to track down the trolls but both groups were captured. Crown Guard's leader, Silverfang, managed to convince the majority of the trolls that their methods were wrong and challenged their leader, Phough, to single combat while the Tomorrow People and Crown Guard freed themselves. Phough then tried to kill Alchemy's mother during the massive fight that broke out between the trolls and the two teams, but Silverfang saved her and John turned Phough into a golden statue. John then revealed to the Crown Guard that, due to his biochemistry studies, he could now reverse the changes he'd done to people and restored Big Ben and Zero. John returned to the Tomorrow People to finish his training and a few months ago he 'graduated' from the training Madame Tomorrow had been giving him and is looking for a town to settle down in and is debating about moving into either Freedom City, Bay City or Emerald City. He hasn't decided yet but has been showing up randomly in all three of the cities lately. Notes & Comments wrote: Yes, I am a horrible hack. But I couldn't help it. I really liked the character back in the day since he was a fan creation that one a contest to get printed. So sue me. Costs: Abilities 68+ Skills 12+ Advantages 15+ Powers 33+ Defenses 12= 140 pts. Disability: Crestone has a greatly lessened sense of touch since his transformation into his rock-like form. Background: Craig Walters was an average underachieving 16-year-old who got caught in the Silver Storm, his body became a mass of granite-like organic rock. Unfortunately Craig goes wild like many of the other victims of the Silver Storm and is stopped by Princess. Afterwards Craig is examined by representatives of the Albright Institute along with several other Stormers (as those changed by the Silver Storm are called in the media) and eventually returns home after treatments that allowed him to return to him non-powered form. But a few weeks later at school Craig becomes the object of a bully's attention and lashes out using his powers, which results in a large amount of destruction to the facility before running off. So far Emerald City police have been unable to find Craig. Costs: Abilities 44+ Skills 24+ Advantages 18+ Powers 69+ Defenses 15= 170 pts. Motivation ~Thrills: Neville’s adventurous spirit led to his gaining the powers of the Williwaw and thereby the means to seek out more thrills in a life of super villainy. Relationships: Neville has a odd friendship with eco-influenced criminal Tundra thanks to their shared source of powers; sometimes she can convince him to work with her on one of her ‘world saving missions’ while other times he’ll pass on one of her plans since it has no profit in it. Background: Neville Harris was a 3rd generation smuggler, who flew part of his family’s collection of air planes to carry items that were against certain regulations while avoiding those pesky government agents who tried to track such items. Neville grew up listening to his grandfather’s tales of a spirit called the Williwaw by the local Inuit tribe and since Neville’s grandfather had stayed on the Aleutian Islands after his service as a pilot during WWII, the youngster spent a lot of time among the local Inuit tribe and absorbed many of their stories about the Williwaw. But by the time he was an adult Neville had moved to the Yukon Territory, operating an expansion of the family business for several years when he took a job for one Marie Devereaux that changed his life – he met the rogue shaman Ranark. As he’d done with Marie, Ranark used his magic to compel Neville into taking part in a ritual which granted him super powers; so Neville built a scaffold-like structure and stood upon it, prancing to the beat of the Ranark’s drum while he spoke the words that would summon the wind spirit, the Williwaw, which would impart its powers upon Neville. Soon Neville felt the winds gather around him and at first the winds rocked him, making him fight for his footing. Then Neville found a rhythm, almost a pattern to them and he quickly felt like they bolstered him, lifted him up almost, and he suddenly found himself hundreds of feet in the air. As a gale built around Neville the scaffold disintegrated below him as the storm scattered its parts all over the area while he was raised higher and higher into the sky. Neville realized at that moment that the ceremony he had been a part of was not a ritual to summon a Williwaw, but was a ceremony to CREATE a Williwaw. Neville felt primal forces pulling at him, urging him to let go of his mortal body and become one with the wind. But apparently Neville Harris was made of sterner stuff. With a massive effort of will, Neville contained the impulses and internalized the winds within his body. Now controlling the winds surrounding him, Neville brought himself back down to the ground, climbed down the hillside to where Ranark and Marie (who’d already been empowered) were waiting for him. At first Neville, or Windchill as he named himself, worked with Ranark and Tundra (as Marie was code-named) for a while but like Tundra eventually shook off the effects of Ranark’s influence and realized that his plans to return the Earth to a level of technology that closely mirrored his centuries older (which pretty much meant everything Neville enjoyed would be useless). So he and Tundra betrayed Ranark to the North Watch and made their own escape. For someone with Neville’s lax attitude about the law and its regulations, his powers opened up a whole new spectrum of possibilities in ways to make a profit. After testing himself in a few simple robberies and a couple of interesting smuggling jobs, Neville came to realize that he had what it took to join the ranks of super villainy and hasn’t looked back since. Costs: Abilities 42+ Skills 17+ Advantages 6+ Powers 47+ Defenses 23= 135 pts. Identity: Heather keeps the fact that she has superhuman powers a secret from all of her friends. Lost Girl: Heather doesn’t realize that it was a low security Project: Icarus facility that she escaped from and that they have been keeping an eye out for her so they can bring her back in for more studying and possible use as an operative. Secret: That she is actually a seventeen year old runaway. Background: Heather Meloni spent most of her childhood at a State Home for children in Chicago, Illinois following her parents deaths in a plane crash. When she was fifteen, Heather began suffering intense headaches that a doctor, unknowingly, incorrectly diagnosed as migraines. 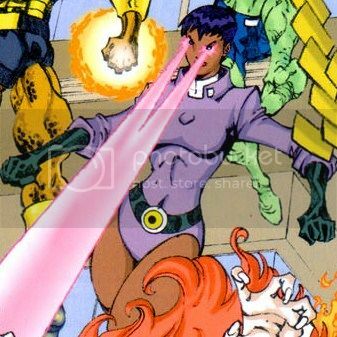 The truth of the matter was that Heather’s mutant powers were starting to manifest and her headaches were the first stage. Months later Heather’s enhanced visual abilities emerge, at first making things difficult to manage as her perception of her surroundings are drastically altered. After working on it over several days time Heather managed to adjust and adapt well enough to no longer be bothered by the enhanced perceptions she gained. She realized that she was a mutant and hoped that her enhanced vision was the only power she gained. Six months later Heather suffered the worst migraine she ever had, so she took medicine and went to bed in the hope that she could feel better the following morning. Instead she woke up in the middle of the night and destroyed the roof of the girl's wing of the state home with a very powerful energy blast. When Heather woke up again, a year had past and she was in some hospital run by the state and she found that her migraines had disappeared thanks to her other power (that of powerful optic blasts) had manifested (as she didn’t remember destroying the roof of the state home a year earlier). Freaking out due to thinking she was in some kind of government run place for meathumans, Heather used a mixture of cunning, stealth mixed with a healthy dose of power usage to escape. After wondering around for the city she found herself in Heather learned she was in Emerald City, a place where there was little to barley any metahuman activity. Deciding it was as good a place as any to start over; finding her way into a homeless shelter where following just over a years worth of work Heather had earned a GED and managed to get a part-time job as a waitress in a small diner on Yellow Brick Row. Then the Silver Storm happened and Heather’s world got turned upside down again. While she wasn’t affected by the event, she did use her powers to protect herself and those in the diner from the rampaging Stormers who tried to enter the place. For her efforts her boss and customers ousted her as a Stormer (which is what they thought was the reason for Heather’s sudden display of powers) which brought her to the attention of Maximilian Mars. Looking to put together a team of local heroes to protect Emerald City, he reached out to Heather and made his offered to her only for her to turn him down. Though she did explain the circumstances of her life and how she had come to be present at the Silver Storm. Mars realized that Heather wasn’t old enough to be on her own so he made the counter-offer of financing her education as long as she’d allow his techs periodic checkups to make sure her powers didn’t give her any problems. (the truth of the matter is that Mars wants to find out if there is perhaps something in Heather’s DNA that made her resistant to the Silver Storm’s effect and if something could perhaps a kind of ‘cure’ could be made from her blood for those who were). Heather, not understanding Mars’ true intentions, decided to take him up on his offer and currently is a full time student at Emerald City University. And she comes by MarsTech laboratories to undergo her periodic ‘checkups’ and to practice with her powers as there have been a few rare occasions when Heather has used them to protect both herself and her fellow students from a rampaging Stormer or criminal coming to steal something from the university’s labs. This has led to Optica, as Heather was named by some of those she protected during one of Octaman's rampages, becoming a secondary favorite to Princess at ECU. Costs: Abilities 78+ Skills 19+ Advantages 36+ Powers 9+ Defenses 23= 165 pts. Not From This Time...: Ithaca is from ancient Greece and sometimes has trouble understanding the ins and outs of modern society. Relationships: Ithaca is friends with Daedalus (they knew one another back in the 'good ole days'). Background: A woman named Hellene was part of a sect of female-only warriors who followed the Greek Goddess Artemis, each receiving special blessings (great physical strength, highly acute senses, beauty, wisdom) as a result, known as the Amazons that lived in a city named Themyscira on the isle of Ithaca. Hellene was a captain in that small army, she was also considered to be one of the better tacticians and had the loyalty of a number of the Amazons despite the fact many of them did not serve directly under her. Hellene brought from her home time thanks to a plot of Medea’s which was foiled by Daedalus, but left Hellene stranded in the modern age. She has since managed to adjust somewhat to the times she now finds herself in and for the most part, acts as a hero in Greece using the name of her former home. So a follower of a goddess of the hellenic peoples, named after those people (the proper name for ancient Greeks is actually Hellenes), adventures in Greece under the code-name of a Hellenic island and city-state? If that's not predestination, I don't know what is. While I didn't know some of that I'm more willing to say that it was more like dumb luck on my part. But that works for me either way. Costs: Abilities 24+ Skills 12+ Advantages 8+ Powers 60+ Defenses 18= 122 pts. Motivation ~Greed Alloy wants to earn as much money as she can and is willing to break the law to do it. Relationships: Her brother Jimmy (aka Dreadnaught) and his wife Suzy (aka Tiger Lily). 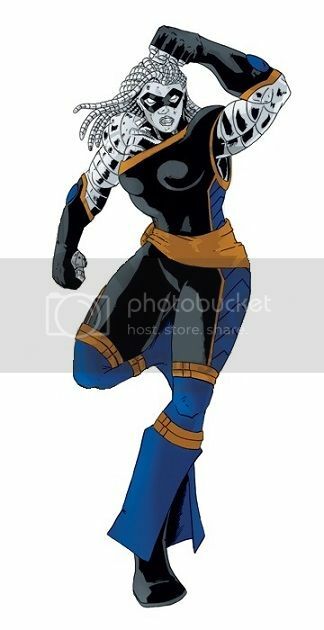 Weakness: Because of her metal form, Alloy is highly vulnerable to Magnetic based attacks. Background: The younger sister of the criminal Jimmy Corrigan (aka Dreadnaught), Lisa Corrigan would develop her own set of powers that mirrored her brothers. Not wanting to reveal her abilities to her parents, as they had a harsh view on metahumans due to her brother’s actions years earlier, she contacted Jimmy on what she should do. Days later he called Lisa on her cell phone and told her to meet him outside of their parent’s home, and at a small diner the two siblings caught up on one another’s lives since they’d last seen one another. A couple of hours later Lisa had met her sister-in-law and Jimmy had offered to teach her how to control her powers and use them since they were a lesser version of his and he had plenty of experience with his by that point. For over a year, Lisa spent hours a week working with her brother on how to use her superhuman strength and resistance to injury in pretty much any possible situation she might find herself in. In addition to that Lisa was allowed to go on a couple of mission with the Black Guard (low-threat ones at least) to help get her used to operating in the middle of all the craziness that goes with being part of a super brawl. Eventually Jimmy declared Lisa as ready as she ever was going to be and he gave her a couple names and numbers to use for contacts in the criminal underworld as well as a couple old Black Guard safe houses they’d not used in a several years for her to use as she saw fit. Now Alloy is looking to make a couple of good scores to make her début in the super crime business. Costs: Abilities 88+ Skills 22+ Advantages 9+ Powers 26+ Defenses 25= 170 pts. Arrogance: He seems himself as superior to humans. Prejudice: He's a large, talking ape with several octopus arms extending from his back, so Octorilla tends to stand out. Background: A eastern gorilla being transported to a zoo in Portland from the Columbus Zoo in Ohio, Mumbah was exposed to the Silver Storm when the driver of the transport he was being hauled in abandoned his vehicle. Nobody realized that Mumbah had been affected by the event and once the situation allowed it his journey resumed. 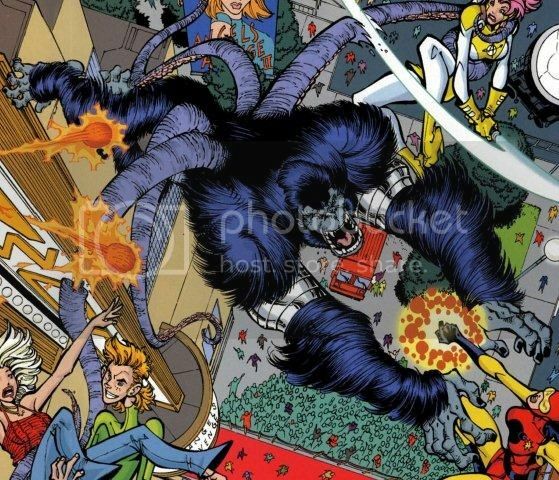 But along the way the effects of the Silver Storm manifested in the gorilla – both his mind and body were transformed as he gained human level intelligence and his strength and resistance to injury increased as well in addition to the octopi-like tentacles that grew from his sides. So when the transport was opened up needless to say the animal handlers were extremely surprised and Mumbah finally had that taste of freedom he’d never experienced ever before in his life (as he’d been born in captivity). Over the following days Mumbah carefully made his way back to Emerald City because he felt drawn to the place for some reason and after meeting the clans that lived outside the city he realized taht he didn't fit in there either. Deciding to set up a place all his own, Mumbah snuck into the Undercity and has spent the following weeks stealing the items he wants or needs to live in his new home. What his future goals might be aren't known at this point. Costs: Abilities 74+ Skills 13+ Advantages 8+ Powers 194+ Defenses 26= 335 pts. 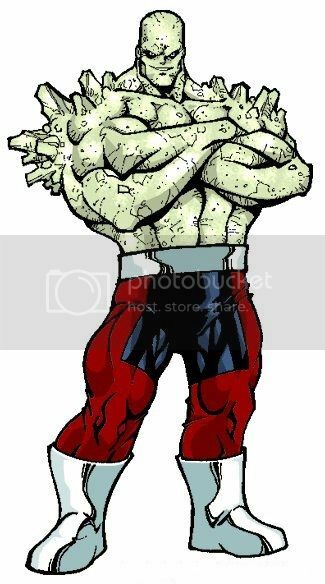 Motivation ~Chaos & Destruction: Blackhead loves using his powers to destroy anything he wants, be it buildings, vehicles, people, whatever. It doesn’t matter to him as long as he gets to cause panic and destroy something. Power Loss: If ever forced into a place of purity, Blackhead's powers are unusable as they are based rot/corruption. Vulnerable: Purity or Nature-based attacks are 50% harder for Blackhead to resist. Background: Nobody knows who Blackhead was originally, but the Raven has managed to figure out that he was a member of one of Grant Conglomerates industrial clean up crews who were sent to deal with one of their secret shipments of toxic waste that ended up exposed to a chemical cocktail of various components that caused one of the large eco-disasters of that year. The problem is that everyone that had been part of that crew is dead now – either from exposure to the chemicals at the time of exposure or else from various cancers due to their exposure. That said Blackhead appears to be more akin to a force of destructive nature as he only wants to lay waste to whatever city he ends up in. There is no rhyme or reason to the destruction Blackhead brings, just his enjoyment of seeing things and people rot away under his touch. Costs: Abilities 86+ Skills 14+ Advantages 10+ Powers 63+ Defenses 14= 187 pts. Insanity: Steven was already a screw loose serial killer before becoming Buzzkill now he’s just a murder machine. Motivation ~Spreading His Word: Buzzkill wants to show the world that life is meaningless and useless and that the only way to buck the system is to give into your violent impulses and let the blood fly. Background: Already a convicted serial killer, homicidal sadist Steven Charles Mitchell became empowered by the Silver Storm. 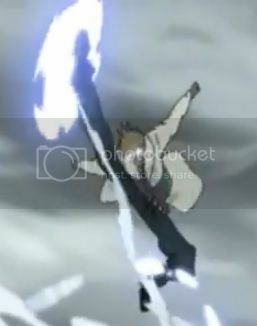 He then promptly used his powers, the ability to generate energy blades anywhere across his body (that resemble chainsaw blades thanks to how they seem to move around his limbs), to cut a bloody escape route out of prison so he could continue his ‘all important work’ – proving the philosophy that life is meaningless and futile, and that spreading chaos through random acts of bloodshed is the ultimate freedom. Considered to be among the most dangerous criminals of this time, Buzzkill (as Steven was named by the media) engages in acts of violence that most people find revolting and disturbing all at the same time. Needless to say people either hate the man or are fascinated by him, a fact Buzzkill knows and will sometimes take advantage of to gather minions to help him on his ‘Chaos Crusades’ (which are little more than wholesale acts of mass murder). Recently AEGIS has learned that Buzzkill is trying to recruit metahumans to his side, looking for those who are mentally unstable enough to work with him and help him spread his all important word. Costs: Abilities 96+ Skills 42+ Advantages 36+ Powers 56+ Defenses 25= 255 pts. Motivation ~Thrills: Paydirt LOVES the thrills he experiences while robbing a mark. Background: Nothing is known about the thief named Paydirt, and he isn't sharing anything. What is known is that he's been making a name for himself by pulling off robberies the likes of which haven't been seen in decades. But what's even more confusing is the fact that half the time Paydirt returns what he steals. In correspondence he has with the media Paydirt has said plainly that he didn't want to keep the items he'd taken, he just wanted to prove that he could steal it because it was said it couldn't be done. Despite the fact 99% of his crimes aren't violent in nature; Paydirt is still breaking the law and is climbing his way to the top of AEGIS' most wanted list as well as the Freedom League's. But the way Paydirt looks at it that just makes his next theft all the more challenging. So when he manages to pull it off it will be all the more impressive. Costs: Abilities 60+ Skills 29+ Advantages 17+ Powers 72+ Defenses 20= 198 pts. Dissociative Identity Disorder: The Arcanist suffers from DID, with the dominate personality of Tyler having control most of the time. However, whenever a natural 1 is rolled, Daniel takes control temporarily. Roll 1d20 to determine how many minutes he has before Tyler reasserts himself. Motivation ~Thrillseeker: The Arcanist views his crimes as a game, where he challenges heroes in an attempt to humiliate them. Background: At the age of eight Daniel Garrison became interested in magic after seeing Magus the Great perform his stage show. At the age of twelve Daniel performed his first show for his neighborhood, then by the time he was fourteen Daniel was performing in talent shows (both school sponsored and publically sponsored) and by the time he was sixteen Daniel had a semi-regular show at a couple of local dinner theaters. His only problem was his overly-down-to-earth, emotionally distant, and single father (as Daniel’s mother died giving birth to him), who considered magic to be something best left in the realm of childhood and not something that should be pursued as a profession by an adult, a belief he constantly told Daniel during the many arguments the two had over the years. Despite the lack of support at home Daniel continued to practice his craft and by the time he graduated from high school, Daniel had decided to commit himself to a career as a professional magician and instead of attending college, as his father wanted, he hit the road and began touring with other traveling performance acts. During that time Daniel learned a great deal about showmanship and how to play to an audience while increasing his knowledge of stage magic by reading about the history of magic in public libraries. He also studied the arts of mysticism, music, martial arts, as well as a few fields of science and technology to fully round out the skills Daniel felt he would need to develop his stage act. Several years later Daniel had developed something of an underground following based on his act and the traveling show he was with made a stop in his old home town. That night Daniel put on the show of his career – pulling out all the stops to impress his former peers and perhaps secretly hoping his father was among the audience. By the time he finished the crowd was on their feet, cheering and clapping their approval of his act. It was a natural high that Daniel could barely explain and on something of a whim the young man decided to see his father so he could tell him just how well he’d done, but Daniel found his father waiting for him on the front porch, wearing his usual scowl. None the less Daniel proceeded to tell his father about his show only for the senior Garrison to stop him and explain that he’d recognized Daniel’s stage name (as it was only slightly modified from the one he used developing his act as a teenager) and had attended the show. Mr. Garrison described the show as "comical" and "catered to the short-attention spanned, selfish and under educated younger generation who don’t even have the common sense to pull up their pants". And that was it. Something in the back of Daniel’s mind finally snapped from the emotional abuse he’d received all his life from his father and Daniel was no longer in control of himself, someone else was; and that someone knew exactly how to handle the senior Garrison. Minutes later the person who was not Daniel was loading up his father’s lifeless body into the trunk of his car and headed for the river just outside of town, then Tyler (as the new personality decided to call itself) made his way back to where the other members of the traveling show had made their camp. It was a few days later when Tyler decided to pack up his belongings and left the show after he beat the owner/show announcer into a bloody mess. After that Tyler had the good fortune of learning that Carmine Bloom, who was also slightly better known as Magus the Great, was looking to take on an assistant. Deep down Tyler still wanted to be famous as Daniel did so he contacted Bloom and after a short interview where Tyler demonstrated his skills, he was hired. For a few years Tyler helped Carmine develop tricks from initial idea through designing and building clear up to final testing, further refining and developing his skills. 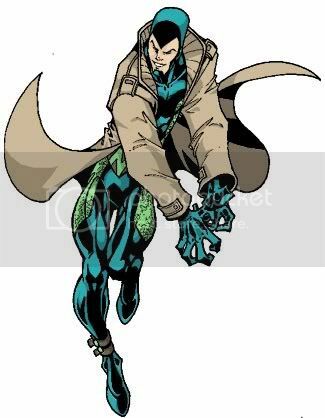 Then Carmine’s career took its tragic turn that led to him becoming the super crook known as the Magician, which left Tyler out in the cold as no other magicians would work with him either due to Carmine’s poor professional reputation or his growing criminal reputation. Tyler, understandably, became extremely frustrated with his situation and in a fit of anger decided that if he was going to be treated like a crook then he’d make sure to be the best one he could. And it was that night the last of Carmine’s equipment disappeared along with Tyler. Eleven months later Tyler finally returned to the public eye, appearing in Bay City but the public only knew him by the name he introduced himself with – The Arcanist. Following that he transformed all of the members of the Champions (except for Zenith who was out of town on personal business at that time) into statues and went on a crime spree that only ended when the hero known as the Crusader brought his magical sword to bear against the Arcanist’s ‘magic’ only to find out he’d been faking it all with high tech devices of his own design. The Arcanist was forced to undo the statue effect to the Champions before being taken to jail, not that his stay lasted too long. Not discouraged by his failure, Tyler keeps staging fancy and elaborate crimes, runs afoul of one hero or another, is beaten and sent to jail only to break out again and repeat the process over again. Costs: Abilities 86+ Skills 19+ Advantages 10+ Powers 42+ Defenses 23= 180 pts. Arrogance: The Scarlet Knight is supremely confident in his own abilities, so much so that he tends to underestimate his opponents. More Than Just Another Magical Sword: Members of the Lodge recognize the sword named Crimson Dawn as part of a set of artifact weapons forged during the Magi Wars. There seems to be a presence held within the blade that has a long reaching goal that is a mystery at the moment but the Lodge elders are sure the other artifact weapons are set upon the same goal. Pete’s Not In Right Now…: Peter King has been completely possessed by the spirit that inhabits the sword . Secret: The fact that Peter King and the Scarlet Knight are the same person. 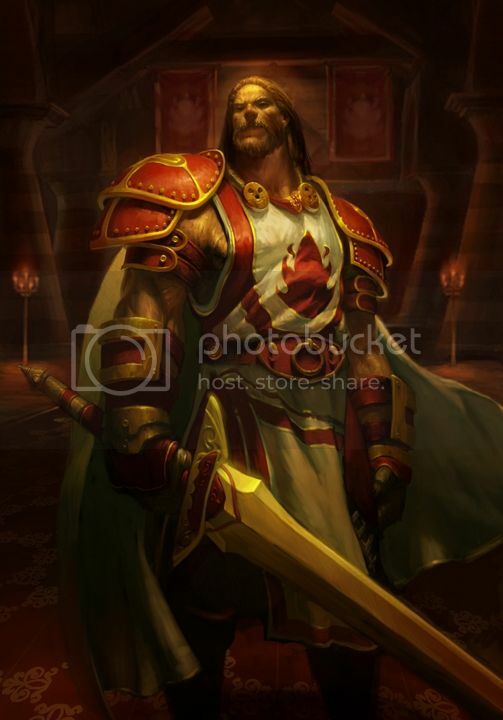 Background: How CEO Peter King, came into possession of the artifact sword named Crimson Dawn isn’t known but after only a few years of being possessed by the malevolent spirit that lives inside the blade there is little left of King. What is more disturbing to the likes of the Lodge is that Crimson Dawn is just a part of a series of artifact weapons that have possessed their owners (all of whom are villains operating within the United States). The members of the Seventh Circle are sure there is only a sinister plan in the works but have yet to figure out what the overall goals of the spirits within the weapons might be. So far they seem more than satisfied with creating mayhem and leaving chaos in their wake. For the time being the Lodge continues to watch the Scarlet Knight’s moves in the hopes that they will learn what he plans for the future might be. So far all they’ve learned is that the Scarlet Knight enjoys fighting and being soaked in the blood of its enemies and that the Scarlet Knight will commit any crime that might give him the chance to fight. Costs: Abilities 74+ Skills 21+ Advantages 8+ Powers 42+ Defenses 15= 160 pts. Motivation ~Greed: The Hypno Hustler wants some fat stacks, cause his lifestyle demands it. Temper: Despite his laid-back attitude, the Hypno Hustler can become angry when show too much disrespect by an opponent. Background: Marlon "Lando" Tubbs was just another kid lost in the foster care system until he ran away at the age of ten and joined a street gang. From there it was just a matter of time before he'd eventually end up dead like all other gang bangers but Marlon had a bit of street smarts before he'd hit the streets and he ended up playing others in the gang against one another for his benefit (not that they knew that fact mind you) until years later Lando was running the gang. But you see Lando had a plan cause he wasn't no sucka, he knew the real money was in the capes game and he knew just how to break into that but he needed the green backs to fund it. So he had his crew run drugs until he had the cash needed for his plan, then he dropped a dime on them and disappeared with all the money. After a trip to the Power House, Lando had a set of muscles fully funded by the work of his crew and somehow aquired the Hustler Shades (as he calls them) and went right to making a name for himself in the super crook set.